Tom Bell can vividly recall the moment nearly eight years ago when fear pulsed through his body. Then 18, he had just received a call from his boss. Six months into a refrigeration mechanic apprenticeship he had turned down a late shift for football training at Morningside. “Then the next day he called me up in the afternoon and it was probably the most nervous I’ve ever been," Bell said. “I guess I had to choose between the two. That was the most on the spot I’ve ever been. I’d never had to do that. I chose the football path." Bell is now in his seventh pre-season and has never looked back. But the journey to becoming a professional player has been far from smooth sailing. A Morningside junior, Bell entered the AFL Draft three times before Carlton recruited him through the 2011 Rookie Draft. “I guess my journey has been a bit of a different one. Getting knocked back from getting drafted for three years and then finally getting on a list,” he said. During those three years he worked odd jobs while prioritising his footy for Morningside. While he was in high school there was no Lions Academy. His classmates at Iona College, on Brisbane’s east side, were unfamiliar with Bell’s version of 'footy'. “AFL in high school was just your rugby players wanting to smash each other,” he said. While a student at Iona, Bell was a champion cross country runner. This endurance has remained. Two weeks ago the muscly forward blitzed the Lions' three-kilometre time trial, finishing second behind Nick Robertson. Recovered from injury & back at training! Bell is determined to earn his spot in the Senior side again. It was his late mother Amanda, who inspired him to run as she had been a competitive runner herself. Most afternoons after school she would drop Tom to cross country training and watch him race in meets on the weekend. “She was awesome like that. She loved her sport and I think she was one of those ladies that would do anything for their kids,” he said. Bell’s mother died when he was 13 and eleven years later, while playing for the Blues, his Dad was diagnosed with cancer. Bell moved back to Brisbane after the 2015 AFL season to be closer to Dad Steve and brother Elliott. Steve is now doing well, and the pair have enjoyed spending more time together in Brisbane. Having his Dad close by in 2017 was a huge relief for Bell, as it was the most challenging season of his career. He is the first to admit, the Lions have not seen his best football. Bell had dominated for the Blues before transferring to the Lions. In his first season, 2016, knee injuries troubled him. 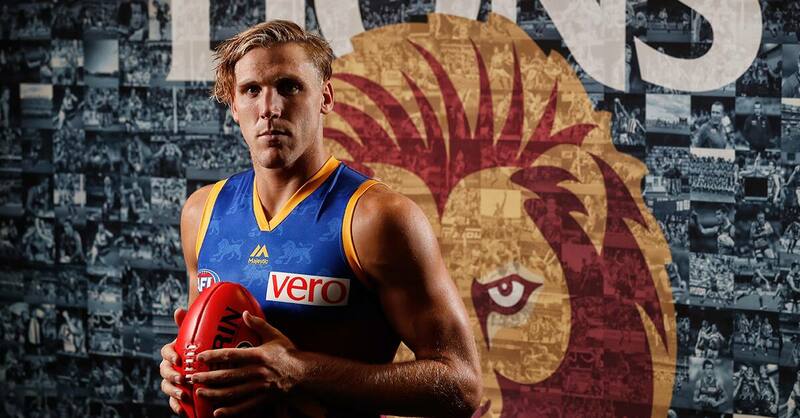 Then in 2017, after Round 4’s loss to Richmond, he was dropped to the Lions’ NEAFL side. “You’re not on an AFL list to play in the Reserves team. That was the first time I’d been dropped in three years,” he said. “When I spoke with Fages we talked about the things I went away from in my game. Things that I stopped doing, were things that got me a Senior game when I first started playing AFL. Bell was elevated to the Senior team for another two games but after Round 9’s loss to Adelaide he was named in the NEAFL side again the following week. In the two games after, Bell was averaging more than 30 possessions a game in the NEAFL and was knocking on the door of the Senior side once again. But on June 24th, in the last quarter of the Lions NEAFL side's 96-point thumping of the Giants he suffered a freak injury; breaking and dislocating his ankle. He was in the care of professionals quickly and had surgery less than a week later. Not only was his season over, but he was in constant pain. It was a difficult time for his partner and Dad, who both cared for him. But he knew it was not the end of the world. Selwyn Griffth, the Club’s Rehabilitation Coach kept him upbeat and assured him he’d be back. A teammate also inspired his recovery. Six months after the injury, Bell is fully recovered and back into full training. Now, his focus is on finding form again. “My aim is to get back into that Best 22 by Round 1,” Bell said. “The first few weeks of pre-season I’ve put my best foot forward in doing that.